"Small, lightweight, quick and portable! 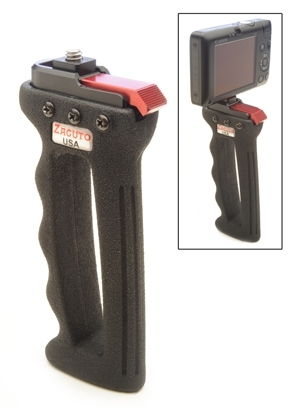 Zacuto's Point and Shoot is the ideal handgrip stabilization system for shooting stable, smooth professional video with any small point and shoot cameras, HD Flip and similar cameras that have a 1/4 20" thread on the bottom." US$89 for a handle to attach to your point and shoot camera. I'm sure it'll help in stabilising the camera; I'm just not sure most owners of such cameras care (as evidenced by the number of nausea-inducing videos on YouTube). Zacuto's usual customers will not be using a puny point and shoot, will they?